Those of us who arrange flowers for our churches want to do our very best work. We want our flower arrangements to reflect the beauty and abundance of God’s creation. It is our tradition in the Episcopal Church to use fresh flowers. That is not to say that we can’t combine them or enhance them with dried or treated plant material. Who hasn’t used baby’s breath (Gypsophila) or statice (Limonium sinuatum) which retain their usefulness and beauty despite being dried? We can gather and preserve flowers, seed pods, grasses, herbs, gourds, berries, vegetables, branches, even mosses and lichens to preserve for use in our arrangements. And, of course, we can purchase plant material from the florist or other floral suppliers. Not all flowers dry well, but those that do should be gathered just as they mature or are in bud, selecting only those that are in prime condition. Collect plants for drying in the cool of the evening, never in the heat of the day or when wet with dew or rain. Many flowers will dry naturally, such as baby’s breath or statice. Berried branches, grasses, grains, reeds and sedges, burrs, cones, fruit, nuts, and seed pods may simply be placed in a cool, dry place to dry. Others, such as ageratum and hydrangeas, and many of the foliages, like boxwood, holly, sea grape, teasel, and snake plant should be placed in a vase or jar with a little water so they won’t dry out too quickly. Allow the water to evaporate. This method allows the plants to retain much of their color. Another method is to remove the foliage (from most) and hang it upside down in a cool, dark, dry place. Bunch flowers in groups of ten and tie together with a string or rubber band. 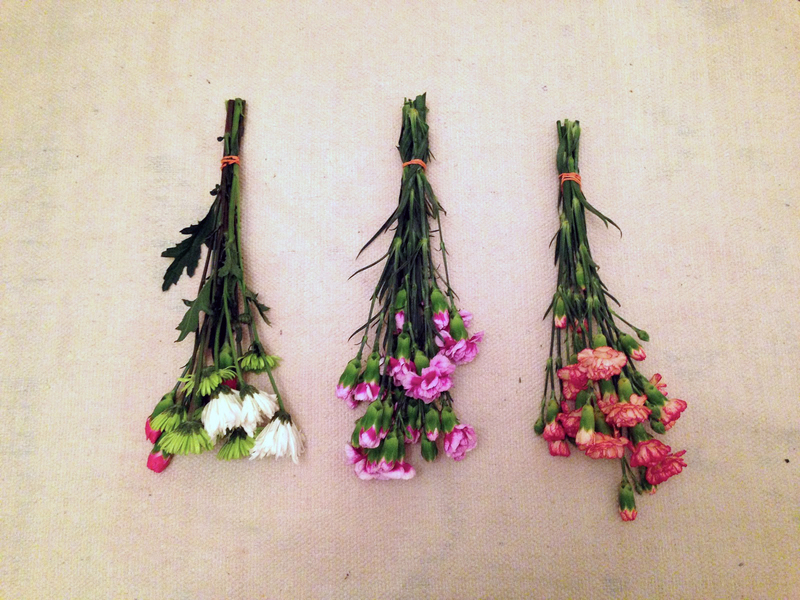 Flowers that may shatter easily should be hung individually. This would include hydrangeas, roses and peonies. In general, allow two weeks for material to dry. Plants such as coleus leaves, dahlias, lilies, pansies, violets and many others, may also be preserved by covering them with various substances. Using a pan, box or carton lined with several thicknesses of paper, add about two inches of fine sand, silica gel (Flower Dri), fine kitty litter with no perfumes or additives, or a mixture of one part powdered Borax and six parts white cornmeal with three tablespoons of salt. Place the flower blooms upright in the mixture and mound the mixture underneath to cushion. Place spiky flowers horizontally. Gently sift the mixture between petals, then cover all sides and top. Leave the container uncovered four to five days for small single-petal flowers and seven to ten days for larger, thicker ones. When dry, gently remove from the mixture. Lay flowers on top of the mixture to firm petals. Gently brush away remaining mixture. Finally, glycerine-treated galax, eucalyptus and magnolia leaves are long lasting and color attractively. Give the stem or branch a fresh cut. Fill a vase with one part glycerin to two parts filtered water. Place the stems in the vase out of direct sunlight. It may take a month or longer to treat the branches, but once dried they are long lasting. Always store your dried or treated materials in a dark, dry place. Store grasses, grains, branches, cones and seed pods in covered boxes. Flowers are best left standing upright in a container with no water. When selecting your plant materials, gather twice as much as you want or need in order to have enough. Experiment. It’s an inexpensive way to increase your supply of flowers and foliage. Keep records of what works for you and enjoy using your preserved plant material to the glory of God.